Harry Leslie Smith has seen it all: World War, huge technological change, and massive social upheaval. He's had a family, a successful career in business, and a busy post-retirement life advocating for social justice. Now, at the age of 94, you'd expect that Harry would be content to rest on his laurels, to simply sit back and reflect on a life well lived. But instead, he continues to fight for equality, with regular speaking engagements, a new book, and a podcast. On this episode of Relate, you'll hear what drives Harry Leslie Smith to reach across generations to help us all avoid the mistakes of the past. On Relate: "Think you have diversity covered? Think again. Diversity is more than skin deep." TAMARA STANNERS:	Imagine yourself in the sunset of your life. Let's say you're in your late 80's, early 90's and you're healthy, but your eyes are getting dim, your hearing's not so great, and getting out of a chair is a major effort. You've seen some amazing things and some terrible things in your long life, World War, massive social upheaval, incredible technological change, and you have a perspective that only time could give you. How do you spend your precious remaining time? Do you spend it in quiet contemplation? Watching TV maybe? Shooting the breeze with old friends over endless games of cards? Or do you fight like hell to bring your wisdom to a younger generation so they won't repeat the mistakes of the past? If you're Harry Leslie Smith, that's exactly what you do, and he is what's happening today on Relate. 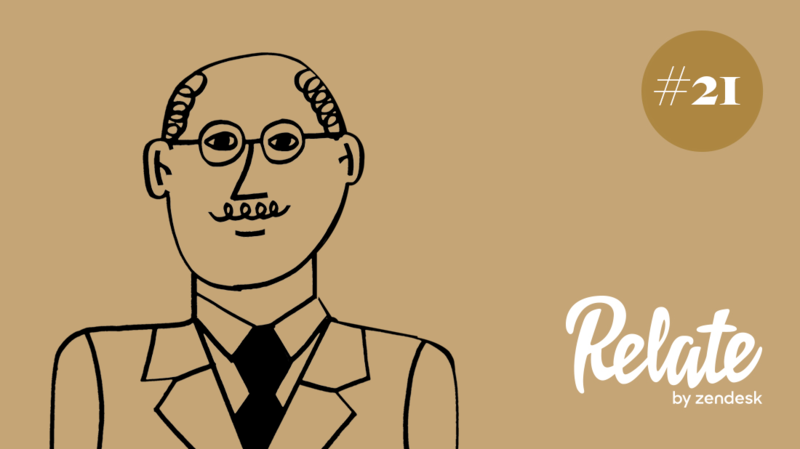 I'm Tamara Stanners and this is Relate by Zendesk, and this week's podcast is all about a relationship that spans generations. The story revolves around a truly remarkable 94-year old man. Andy, tell us about him. ANDY SHEPPARD:	Well, his name is Harry Leslie Smith, and we're going to start our story when he was in his late 70's dealing with a heartbreaking loss. HARRY SMITH:	I remember on the last day I came up early morning, I went over to her and her eyes were closed so I sat at the bottom of the bed. I reached under and stroked her legs. I could see she was going because the blood was flowing into the toes. I jumped up and I went to the head of the bed, she threw her arm around my neck, and she held me so tight I thought she was going to break my neck, but that's how it ended. ANDY SHEPPARD:	That day Harry lost his wife, the love of his life, after 52 years of marriage. Now, you know this kind of thing happens all the time of course, but most people wouldn't respond the way Harry did. HARRY SMITH:	I think I had a feeling that I had been given the advantage of good health for a reason, not to just squander but to try to leave my mark on society, on the world to make people think, to be able to talk to them and tell them, "Life is a wonderful thing. Take a good look around you because this is the only heaven you will ever know. Get to love it." TAMARA STANNERS:	He embraced life and decided not to give up. ANDY SHEPPARD:	But Harry's message is more than that, he's this passionate advocate for democracy. When he was in his early 90's he became a well-known author and public speaker. Today, at 94 years old, he still tours around the world talking about the importance of social justice, which he highlights with stories from his childhood. TAMARA STANNERS:	From what I understand his upbringing just sounds grim. ANDY SHEPPARD:	It really was, it was harsh. I mean Harry's family, they were working-class family, they were crushed by the 1929 Market Crash, but the most emotional of his childhood memories was around the death of his sister, Marianne, who was six years older than Harry. She contracted tuberculosis and loss her ability to speak. HARRY SMITH:	I used to play in front of her wheelchair and talk to her although she couldn't talk back. I just pretended that we were having a conversation. It reached a stage where my mother just couldn't handle it anymore, she said to her husband, she said, "I don't know what I could do anymore. She is not improving." ANDY SHEPPARD:	Harry's mother sent Marianne to an infirmary in the hopes that she'd get treatment there. HARRY SMITH:	They called a horse and cart to transport patients to the workhouse, and my father and my other sister and myself stood outside and watched it galloped away towards the hospital. I remember saying to my dad, "Where is Marianne going?" He said, "To a better place I hope." She died, I believe it was November, because we didn't have money for a grave or a gravestone she was just dumped in a pauper's pit. I think we all cried for the whole day. TAMARA STANNERS:	You can still hear the emotion in Harry's voice when he tells that story. ANDY SHEPPARD:	This is close to 80 years later and it's still hard for him to talk about this stuff, but Harry took a lesson from his sister's death and he recognized how needless it was and how ... During that time tuberculosis wasn't a death sentence if you had money. HARRY SMITH:	Richer people had these clinics where they could go to, and in most cases be saved. I think I realized that if life had been fair as it was for the majority of people with money then it should be fair to everyone. The only way that could happen would be if the health service and anything associated with the health service was made available to everyone, regardless of their pocketbook of wealth. TAMARA STANNERS:	It sounds like his sister's death galvanized him in a way. ANDY SHEPPARD:	It absolutely did. I mean, the hardships that he experienced, which could have made him angry or bitter, but they actually made him more compassionate, and they propelled him to action on a local level, like getting involved in his own community, helping out neighborhood kids, advocating for healthcare and social programs, that sort of thing. But he didn't really have a big public persona until quite a bit later in his life. TAMARA STANNERS:	What happened exactly? I mean, it's pretty unusual to want to take on such a busy role in your 90's. ANDY SHEPPARD:	Yeah, for sure, for anyone. ANDY SHEPPARD:	But I think it was what was happening in the world. Harry saw his own parents struggles with the crash of 1929 reflected in the 2008 housing crisis, which left many families homeless, and then more recently with Brexit and the US Election, he felt this need to bring his perspective out to a younger generation. HARRY SMITH:	About two, three, four months ago things started to slide a little more, and I felt that I had to get my name out again so that they would know that I'm still fighting and I figured a podcast was a good idea, but on the other hand I didn't want to put just a normal podcast down. I felt it had to be something that had my stamp. I got this brilliant idea, suppose I'd make it that I'm having a conversation in a railway station with a man who is waiting for a train just as I am, and we are discussing the world. That's what started me off. ANDY SHEPPARD:	That's how the podcast Harry's Last Stand was born, now he continues to travel and speak to audiences, but this podcast gives him this opportunity to connect with younger people. I mean, to anyone really who wants to hear his message, this idea of advocating for equality and access to services for everyone, no matter what their financial situation. I think more importantly, engaging in democracy to keep it alive, and I think Harry, maybe more than anyone knows that time is of the essence. HARRY SMITH:	I always remember something I read in a flower shop one day and it said, "Time is a road upon which there is no slowing down, let alone turning back, so use it wisely my friend for it is short, irrecoverable when passed." TAMARA STANNERS:	Harry Leslie Smith published his fifth book, Don't Let My Past Be Your Future in September 2017, it's published by Little Brown. You can find his podcast, Harry's Last Stand, wherever you find your great podcasts. Thanks to Ashley Walters for that interview, and for helping to produce this piece, and thanks Andy. TAMARA STANNERS:	Harry Leslie Smith is living proof that it's never too late to contribute to your community, your country or your workplace. We've got several articles on the Relate Online Magazine that demonstrate the value of having different perspective and different generations as part of your organization. Check out this article, it's called, Think You Have Diversity Covered, Think Again, Diversity Is More Than Skin Deep. It's all about the value of older workers and you can find it all at relate.zendesk.com. That's it for Relate this week, but there is so much more coming up. Next week we have this fascinating relationship between a teenage boy and Apple's digital assistant, Siri. Believe it or not, it's actually a story about making interactions more human. Subscribe to Relate on Apple Podcasts or wherever you listen, to get that episode and more. In the meantime, for more articles on connecting to your customers in deeper ways visit relate.zendesk.com. If you want to explore technology built to improve your customer interactions, head over to zendesk.com for a free trial. I'm Tamara Stanners, talk to you soon.